The actress looks just as good at 49 as she did in the '80s! The star of films such as "Monster's Ball," "Die Another Day" and the "X-Men" movies is celebrating her 49th today. And she looks just amazing as she did when she burst on the scene in the late '80s. We've taken a look at some of her best moments in style, and at the movies, from 1989 to the present. Berry attends a benefit for the Juvenile Diabetes Research Foundation in New York City. Berry receives kisses from actors Tommy Davidson and Joseph C. Phillips at the premiere of "Strictly Business." A publicity still from the year that Berry made "Boomerang" with Eddie Murphy. Berry at the MTV Movie Awards at Sony Pictures Studios in Culver City, Calif. in 1994. Berry at the People's Choice Awards in 1995. Berry with then-husband David Justice and child actor Marc John Jeffries at the premiere of "Losing Isaiah" in 1996. Berry poses with her Emmy Award for Lead Actress in a Miniseries or Movie for "Introducing Dorothy Dandridge." 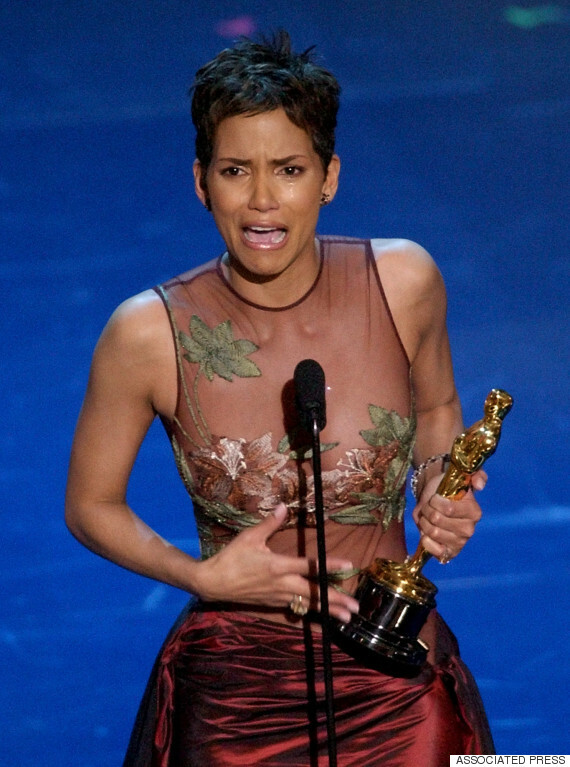 Berry reacts as she accepts the Best Actress Oscar for her role in "Monster's Ball." Berry stars as Jinx Johnson in "Die Another Day." Berry attends a screening of her film "Things We Lost in the Fire" at the RomeFilmFest. Berry arrives at the Hollywood Awards Gala in Beverly Hills, Calif.
Berry turned heads with this dress she wore while promoting her film "The Call" on "The Tonight Show with Jay Leno." Berry plays Storm in "X-Men: Days of Future Past" and other "X-Men" movies. Berry arrives at the Hollywood Foreign Press Association's Annual Grants Banquet in Beverly Hills, Calif.